A New Moon is an important signal that something new has to be initiated, it represents a time to plant a seed for the future and it can be seen like a doorway to a new energy. The Sun, the Soul, is conjunct the Moon, which represents the past, burning the old through its flames and assisting the new to sprout within us. On 30th October the New Moon will be at 7° in Scorpio, a deep intense degree related to the quiet openness to higher inspiration in the Sabian symbolism. This symbol refers to the mystic love for God; the love, which simply focuses itself within the soul of those who are open to reflect the light coming from Spirit. It talks about accomplishing an inner state of quiescence, where the inner conflict between the personality and the soul has come to an end and we are ready to accept the guidance from the Higher Mind. In the colour language Scorpio is associated to turquoise, the colour which relates to the process of individuation and generates within us the question “Who am I?”. 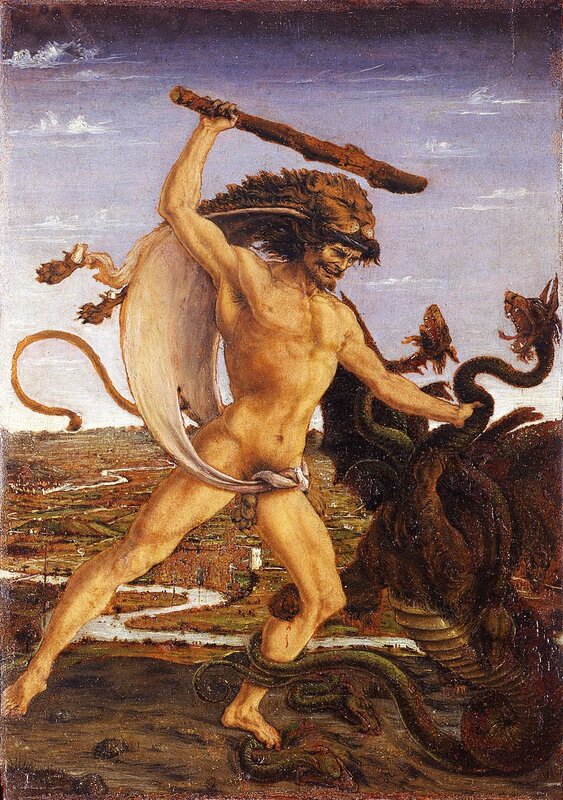 Scorpio is about the victory of spiritual desire and the triumph of the Soul over the personality. The keynotes are test, trial and triumph, meaning that we are going to experience a time of recapitulation and reorientation. When we are under the Scorpionic influence, the most occult factors emerge from the past and begin to engross our attention until the personality and the soul stand face to face and facing them becomes unavoidable for us. Eventually, the light of the personal self will fade out and wane in the blaze of glory emanating from the soul. The Sun and the Moon will be conjunct Mercury at 9° Scorpio, sextile Pluto conjunct Mars in Capricorn, trine Neptune and the South Node in Pisces. At the same time Pluto and Mars will be activated by the squares created with Uranus and Eris in Aries, and Jupiter in Libra. This means that Mars and Pluto will give birth to intense situations/conflicts in order support the inner process of rebirth into the soul energy. Mars and Pluto are the rulers of Scorpio on the Mutable Cross (personality), while Mars on its own rules this sign on the Fixed Cross (the disciple) and Mercury on the Cardinal Cross (initiate). Mars vehicles the 6th Ray of Devotion, which is the power to kill out desire, to detach oneself; it is “the Visioner of Reality”, “the Crucifier and the Crucified”, “the Upholder of Truth”. Pluto conveys the energy of the 1st Ray of Will and Power, which is related to the “Lord of Death”, the “Liberator from the Form” and “the Opener of the Door”. 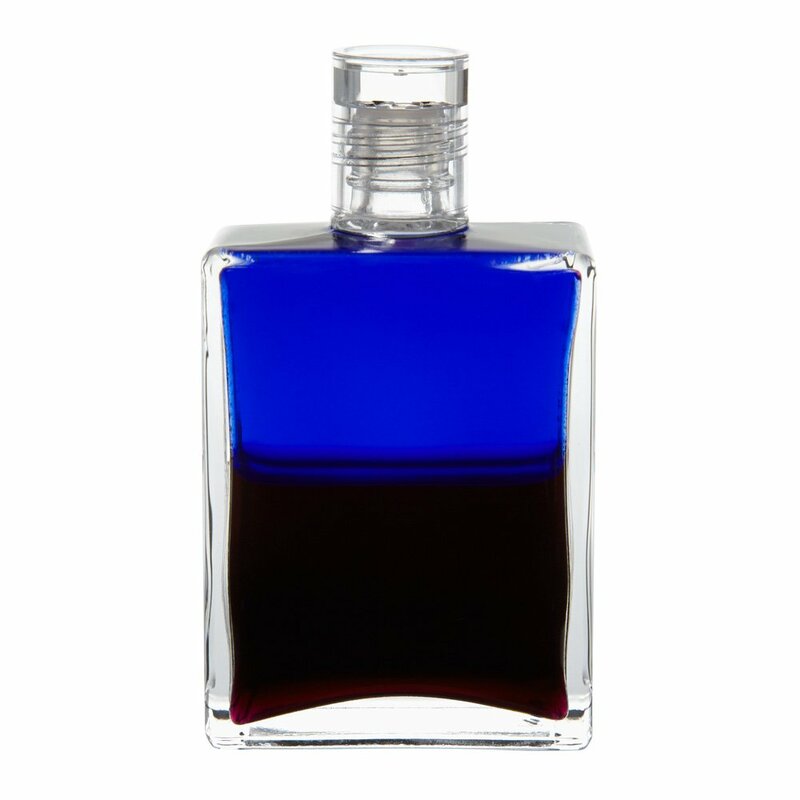 In the Aura-Soma® colour system Pluto is associated to the Equilibrium bottle 0, the Spiritual Rescue, royal blue over deep magenta. Royal blue is about clarity at the sense doors (the 5 senses and the mind) and the higher mind functions (clairvoyance, clairaudience, clairsentience). It is about clarity in relation to our spiritual self. Rescue means re-cue, to re-center ourselves in relation to who we truly are as a soul. 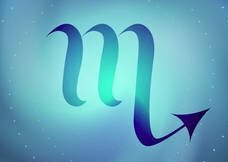 Mercury, the Messenger of the Gods, will support the communication between the Higher and the lower mind allowing Jupiter in Libra to sustain the coming together of the heart and the intellect, the inner marriage between the soul and the personality. Uranus and Eris, the Goddess of Discord, will bring to the surface all the hidden issues that are ready to be faced. 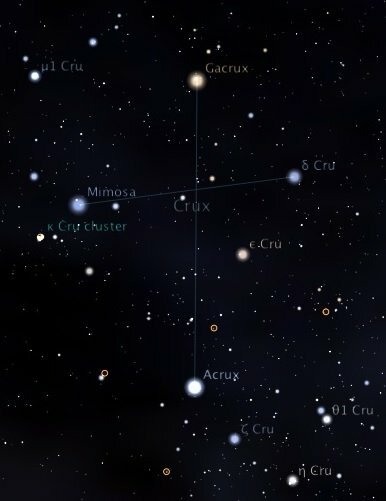 The New Moon-Mercury axis will be conjunct the Fixed Stars Gacrux at 7° Scorpio and Acrux at 12°, respectively representing the top and the bottom part of the Crux or Southern Cross constellation, which lies on the Milky Way, next to the Centaurus constellation. In the ancient times this cross was visible in our latitudes, and it is said it was last seen on the horizon of Jerusalem about the time that Christ was crucified. For this reason it has been associated to the Calvary Cross and prefigured on the sky as an indication of the possibility of our redemption. 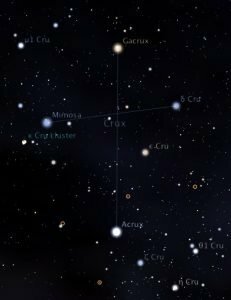 The Southern Cross is also related to the mystic Tau/Tav, the last letter of the Hebrew alphabet, which means a “boundary mark”, a “limit” or “finish”, the “coming to an end”. This letter is called the “Seal of Creation”, the “Kingdom of the Infinite One” and is asking us to live each moment of our life in alignment with the Will of God. God’s Seal in Creation is Truth and the culmination of truth is the “knowledge of not to know”. As the Soul is neither in the past nor in the future, and because it has released all the limitations of the personality, we often experience its energy and inner presence as a sense of disorientation. In reality, in that very moment, we are fully open to the Divine guidance as we are standing in the eternal presence of Love. This New Moon in Scorpio represents the time to dive and get lost into the depth of the Plutonian underworld, the deeper intuitive side of who we are, where we will truly understand the power and beauty of our own light. The death on the Cross will coincide with the death of the personality, the giving up on controlling our life and meeting with the truth/love of the soul so that we may resurrect to a completely new way of being. In that moment all the inner doubts will be removed by the gentle whisper of the voice of the soul coming from the heart at the centre of our being. The inner struggle will be over, the misunderstandings of past will be cleared and we will deeply appreciate how worthwhile it was to accept the truth of our own soul and be transformed by the power of its true Love.